It’s estimated that over two million bones are fractured due to osteoporosis in the U.S. every year. The International Osteoporosis Organization says that worldwide a bone is fractured every 3 seconds. With the aging baby boomer population growing in the U.S., these statistics will increase. But there are steps that you can take to prevent bone loss and monitor your bone density as you age. Your bones are dynamic. They are living and growing tissue. They build up and breakdown throughout your life with your peak bone density mass determined between the ages of 18-25. But as you age, the balance between bone formation and bone loss starts to change. By midlife, bone loss usually speeds up. This is normal. But when the balance is tipped, osteoporosis occurs when you lose too much bone and make too little. One out of every two women are at risk for developing osteoporosis and one out of every four men are at risk. Women are at a higher risk due to the loss of estrogen as they age. In fact, in the five to seven years following menopause, women can lose up to 20 percent of their bone density. Can you prevent bone loss? There are some simple steps that you can take to make sure you are contributing to and maintaining healthy bone density. Consult with your physician. If you are concerned about bone loss, meet with a medical professional to evaluate your lifestyle, review your medical history, assess your risks of bone loss, and take a bone density test if needed. Weight bearing exercise. Regular exercise is invaluable to your overall health and wellbeing. But in terms of bone loss, weight bearing exercise is proven to stimulates cells in the body to make new bone. Calcium and Vitamin D. We all know that calcium is vital to grow strong bones, but vitamin D is vital for your body to absorb calcium. An easy way to get vitamin D is to go for a walk outside to get a dose of sunshine. Supplements may also be recommended by your physician. Well balanced diet. Eat plenty of leafy green vegetables, fruit, dairy, fish, and fortified foods to get the vitamins and minerals that you need to build strong bones. Live a moderate lifestyle. Your lifestyle can affect your bone density. Health care professionals recommend not drinking in excess and to stop smoking. What is the medical exam for bone loss? A bone density test will evaluate several different bones to determine the strength and the potential risk that you will develop osteoporosis. Typically, the bone density test is done on the spine, hip, wrist and heel. The DXA scan is the most widely used bone density scan that is painless, using x-ray technology. A bone density test is the only test that can diagnosis osteoporosis before a broken bone occurs. Along with the bone density test, your medical professional will also review your medical history, perform a physical exam, and order laboratory tests. From the results, your physician and you can determine a plan to addressing any concerns. Will I know if I have osteoporosis? Often times, osteoporosis will happen without notice in the early stages. Bad posture, shortened height over time, back pain, and feeling unsteady can be signs once the bones have weakened. 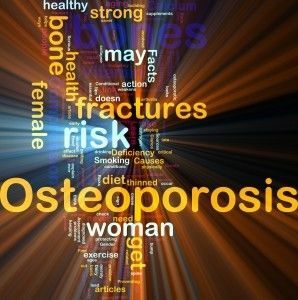 The only way to diagnose osteoporosis is with a bone density test. In addition to meeting with your primary care provider, we recommend the National Osteoporosis Foundation as a good resource for detailed information about osteoporosis. You can find them here.